1886 was a big year for "big town" of Chillicothe, Missouri. It was the year that the Chicago, Milwaukee and St. Paul railroad came through, the "Water Works" was established, roads were being paved, and electric lights began to illuminate the town. It was also the year that John Clifton Lankford came into the world. He was born on Halloween, and being the third child to be born within three years, parents Thomas and Flora Lankford, certainly had their hands full. His father, a publisher of the one of the local newspapers, was 37 years old at the time of his birth, and Flora had just turned thirty. She was a respectable, quiet woman with high ideals. She loved her children dearly, and in all of her deeds tried to instill in them a "love of right and justice." The Spanish-American war began in April 1898 and ended with the signing of the Treaty of Paris on December 10th of that same year. In 1900, the Lankfords were living at 330 Dickenson Street, and John was attending school. It is likely that he was attending the high school in the square bounded by Ann, Elm, Vine and Third Streets. Built in 1876, it was "considered one of the finest public school buildings outside of St. Louis." This was the year a circus came to the town of Chillicothe advertising the miracle of a "horseless carriage". Schools were dismissed early for the afternoon so that students could witness first-hand their first glimpse of the "automobile". John was 15 years old. In September of 1901, news would have been circulating of the assassination of President McKinley and the induction of his successor, Theodore Roosevelt. In 1903, the Wright brothers made the first controlled, sustained flight in an airplane, something previously only dreamed about, but never thought possible. That November, 18 year-old John began working as a driver for the Pacific Express Company. Two years later, John was promoted to express messenger on the Wabash and temporarily transferred to Moberly, about 80 miles southeast of Chillicothe, where he ran the route between Moberly and Des Moines. He visited his family often, and within a matter of months was transferred back home when a position at the Chillicothe office freed up. Around 1906, John went in with a group of nine friends to buy a cabin on Bear Lake. It was situated on the back road to Utica, and the fellas lovingly referred to it as the "Lingo Club". There, they and their friends would spend weekends here camping, fishing, and having giant cookouts. Sometimes the ladies were even invited. One such lady in particular was a Miss Stella Schrader, who would feature prominently into John's life going forward. The crew enjoyed going out to parties and dances on the weekends, and in his early 20's John even served as treasurer for Chillicothe's 1906 Dancing Club. His circle of friends joked with John about the time he traded one of his horses with a farmer the fall of 1906 and got the short end of the stick. It wasn't until later that he realized the horse he'd received only had the front two shoes on, while the back had been missing. In the summer of 1907, John and three of his friends had the novel idea of building a "houseboat" from scratch, and floating it down the river to New Orleans over six weeks time. The plans for the boat included four rooms and full furnishings, though it's unknown if their plans ever came to fruition. This same year, the city of Chillicothe refused to pay the heightened prices that their Water and Light Supply Company demanded. This boycott strategy was taken in an attempt to coerce the supply company into selling to the city, who believed they would be able to better manage it, but was unfruitful. A lawsuit was filed and eventually taken all the way to the Supreme Court. Residents had to once again carry lanterns when they went out at night, as city streets were completely dark. This blackout period lasted for four years as the struggle between the city and the supply company continued. In February of 1908, a giant local option parade was held in the downtown square, encouraging voters to turn Chillicothe into a dry city. In the end, both Chillicothe and Livingston at large voted against the sale of liquor in within county limits and in May, thirteen saloons were closed in Chillicothe. Booming town as it was, it wasn't long before alternate business filled the vacated buildings. In 1909, William Howard Taft is inaugurated as the 27th President of the United States. In 1910, John was renting a room from the McBride family at 1065 Jackson Street. By 1911, he'd moved back to Moberly for work, but continued to go back to the city of Chillicothe regularly. The frequency of his visits increased over the summer, and by fall that November, it was evident as to why. The first official announcement of the engagement of John to Miss Stella Schrader was made to the congregation at St. Columban's Church on November 12th. On November 28th, at that very same church, the two of them were united in marriage. After the ceremony, they returned to Moberly where Stella made her home with John. That following spring, Stella discovered that she was pregnant, and on October 20 1912, she gave birth to a 7-pound baby girl. They named her Alice Louise. In 1913, Woodrow Wilson is elected the 28th president. By 1914, the family of three were living at 311 Ault Street. The war had been escalating in Europe, and that summer, President Woodrow Wilson officially announced the United States' "neutral" stance. This must have been a relief to John and Stella; not only did they have a toddler to take care of, but Stella was once again expecting. Just before noon on a Sunday in October of 1914, Stella and John welcomed the birth of their second child. It was a little boy this time, welcomed into their home in the usual way. They named him after his father, little Johnny Carlisle Jr., though most would end up calling him Jack. Like clockwork, two years later, in the summer of 1917, their third baby - Kathleen Leona - was born. By this time, John had taken out a mortgage on a house at 927 Rollins Street; a home where his family could - and would - continue to grow. It was a two-bedroom home with a large front porch; Jack slept in the same bedroom as his parents while the girls shared a room. The close quarters were not necessarily a bad thing, especially in the cold winters when the only source of heat came from the wood stove in the dining room. When summer came, the children would gather cherries from the tree in their back yard and seed them until their little fingers were stained a sweet ruby red. Over the next ten years, the house sustained a value of $4,000 (comparable to $58,000 today). That November, President Wilson won re-election under the slogan "He kept us out of the war", and yet that following spring the United States declared war on Germany, joining the allies in World War I and forever changing America's relationship with the world. John, at 30 years old, registered for the draft that summer, but was able to avoid service, citing his wife and three young children as solely dependent on him for support. The country saw a mandatory sobering in January of 1919 with the ratification of the 18th Amendment. Suddenly, the sale and consumption of alcoholic beverages was legally prohibited throughout the United States. Underground (and not so underground) bootleggers aside, this would remain official law for the next 14 years. That same summer, the Treaty of Versailles was signed; it took effect on January 10, 1920 putting an official end to the war. On August 18, 1920, Stella, among some 26 million other women throughout the United States, was finally given the right to vote as the 19th Amendment granted universal women's suffrage. That following November election, Warren G. Harding won in a landslide, bringing the republican party back to the White House. In the summer of 1921 the Centennial Road Law was signed, leading to the construction of the first modern system of Missouri highways. As the highways came in, the railroads were no longer the only modern mode of transportation in the area. In August of 1923, President Harding succumbed to a fatal illness and his office was replaced by Vice President Calvin Coolidge. The Lankford family consisted of just the five of them for a while. Then, at 39 years old, and seven full years after the birth of her last child, Stella found that she was once again expecting her fourth baby. In the summer of 1924, John's fourth child, Harold David, was born. When John was about 42 years old, he likely would have witnessed the marvel of sliced bread, introduced to the world right in his own hometown. Chillicothe Baking Company was reported to be the first bakers in the world to sell this product to the public, and from there it caught on like wildfire, from Kansas City, to St. Louis, and beyond! The small-town Baking Company's sales reportedly increased by 2000 percent within 20 weeks' time. In November of 1928, republican President Herbert Hoover entered office. In the summer of 1929, John and Stella worked with neighbors on a petition to have their street fully resurfaced as far west as it ran (or to Pine Street at least), disregarding the 1200-foot law that was currently in place. Up until this point, parts of it had been fixed here and there in patchwork fashion, and the residents were tired of it. Two months later, on October 29, 1929, the stock market plummeted, beginning what would later be known as the Great American Depression. In September of 1932, John and Stella hosted a huge neighborhood picnic at their home. The meal was served on tables decorated with baskets of cosmos, and dozens of families were in attendance. That very same year, President Franklin D. Roosevelt entered office with a landslide victory. That December, when John was 47 years old, prohibition officially ended. In January of 1934, John, along with seven other employees of the Railways Express Agency, organized a Railway Express Business Club. The club held 38 members from Moberly, Columbia, Centralia, Mexico, Macon, Salisbury and Brunswick. John was the first standing President. In May of 1935, John's position as express messenger and mail clerk was transferred to the big city of St. Louis. Their West Rollins home was rented out to the Wegeners, and his family packed up for the big move. Friends of Alice and Kathleen threw a bridge party for them in honor of their move, and showered them with little remembrances to take with them. That September, only a few months after the move, John's mother passed away. Flora had been ill for several months, and well taken care of at the home of her daughter, Mary Dorsey, in Cameron. Friends and relatives traveled in from out of town to pay their respects. Two years later, in September of 1937, John's brother Harold died at his home in Seattle after multiple surgeries to alleviate his stomach ulcers. In the fall of 1939, the United States once again declared its neutrality in the European war. By 1940, the family was renting an apartment for $32 a month. John was making $2400 a year at the Express Company, and while Kathleen had moved out on her own by this point, Alice and Jack had both gotten jobs of their own as well. Alice was working as a teller at a local bank, and Jack as a machine operator at Monsanto Chemical Company. In the summer of 1940, Jack announced to his parents his engagement to girlfriend Dorothy Mullen, and on July 16, 1940 they were married in St. Margaret's Catholic church. 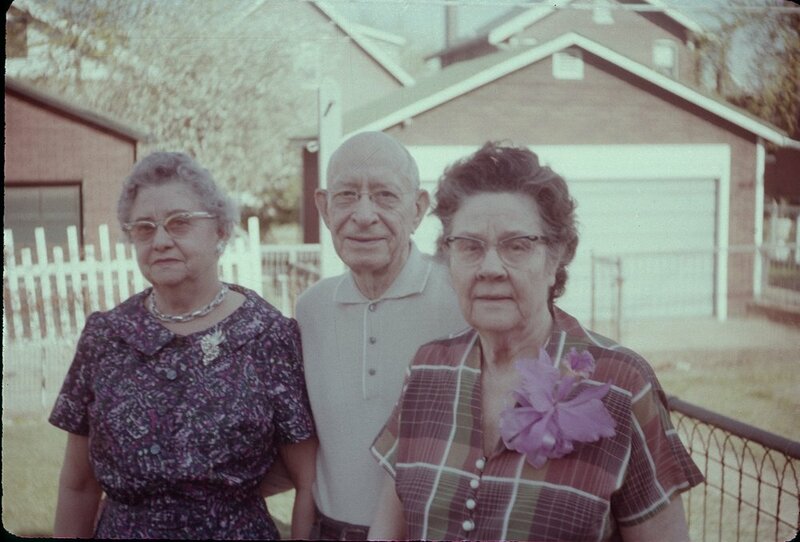 The modest wedding party was made up of Jack's younger sister, Kathleen, and a friend, Otto Rickey. The ceremony was followed by an intimate breakfast at the Rose Bowl with their immediate families, and from there it was on to Miami, Florida, where they spent their honeymoon. Around this same time, Kathleen had received her B.S. in Nursing from St. Mary's Hospital and was preparing to leave for Lancaster, Pennsylvania where she had accepted a position at a hospital as instructor of nursing. John and Stella's kids were all grown up. In September of 1940, amidst an escalating situation in Europe, the U.S. Congress enacted the first peacetime conscription draft. John and Stella's fear must have been great, as their children were right at the peak draft age. A month later, F.D.R. won his third presidential election, becoming the first man to hold office for three (and later four) terms. In November, John received news of the sudden death of his youngest brother Eldon, of pneumonia. Eldon had been living in Spokane, Washington for most of his adult life, and that is where he was buried. In 1941, news hit of the terrifying and tragic Japanese attack on Pearl Harbor, and the U.S. declaration of war soon followed. One Tuesday morning in April of 1944, while John was on his usual route from St. Louis to Omaha, his train was suddenly derailed during a head-on collision of passenger and freight trains just west of Gallatin. John, along with several other crewmen leapt from their posts to save themselves, and were luckily unharmed. The train was rerouted to Chillicothe, and he took the opportunity to write to family and let them know he was safe, assuring them that "he was still holding his record of almost 35 years without a serious mishap." On April 12, 1945, at the height of the war, President Roosevelt died suddenly, and Vice President Harry S. Truman assumed the role of President. This must have produced an inkling of pride for Jack and his family, Truman being from his very own home state of Missouri. Four months later Truman issued orders for the use of the atomic bomb on both Hiroshima and Nagasaki, leading to the surrender of the Japanese delegation and the end of WWII. It may have been a time of peace, but the conflict was not over. Instead, a new period of Cold War began and fear of the communist threat began to sneak into the American psyche. On June 15, 1946, Jack and Stella's eldest daughter, Alice, married Courtney Rudy. It was also around this time that the grandchildren started arriving. The summer of 1950 saw war once again - this time in Korea. It lasted three years, but is often termed the "Forgotten War". In addition, the "Red Scare" was really starting to intensify. At 65 years old, John finally retired from the Railway Express Agency on October 3, 1952. He had been with the company for close to fifty years. One month later, he witnessed the election of Dwight D. Eisenhower in another landslide. By this time, John and Stella were living at 3636 Bamberger Avenue. The next year, the first color televisions go on sale. NBC was the only network to broadcast in color at the time, and the sets were very expensive, so they didn't really gain household popularity until the early 1960's. May of 1955 brought the integration of public schools in the United States with "deliberate speed", and January of that same year Rosa Parks infamously refused to give up her seat to a white man on the public bus. The next several years would be marked by civil rights protests that would change the face of American society as everyone up until this point had known it. In September of 1956, John was admitted to Barnes Hospital for surgery. In May of 1959, John's only sister, Mary Dorsey, suffered a heart attack and died while visiting her son in St. Louis. In November of 1960, the United States bid farewell to President Eisenhower and welcomed John F. Kennedy to the White House. The fall of 1962 brought about the Cuban Missile Crisis, a conflict which lasted a total of 38 harrowing days in which many believed the Cold War might actually break into armed conflict. Early one Saturday morning in May of 1963, Stella suffered a heart attack. She was rushed to the hospital, but died within a few hours of her arrival. They had been married for 52 years. Her funeral was held at the St. Pius Catholic Church that next Monday morning, and her body was taken back to her hometown of Chillicothe that afternoon, where graveside services were held at the Catholic Cemetery. Not long after, John moved in with his son Jack and family at 705 Buckley Road. That summer, the Civil Rights movement raged on with a march on Washington D.C. and Dr. Martin Luther King's iconic "I Have a Dream" speech. The tumultuous era continued with the assassination of President Kennedy on November 22, 1963. It was an event that would shake the nation to its very core. March of 1965 brought about the decision to send American troops to the war in Vietnam. That October, the great Gateway Arch of St. Louis was completed. In April of 1967, John was admitted to the hospital where he remained in critical condition for six weeks. On May 12th, John succumbed to his illness. A morning funeral was held at St. Matthias Church, just down the street from their home, and after John's body was taken back to Chillicothe to be buried next to his beloved Stella at St. Columban's. John was 80 years old. 1. "." Chillicothe Morning Constitution. 23 October 1905. Newspapers.com digital image. Newspapers.com : 2017. 2. "." Moberly Monitor-Index. 14 October 1905. Digital image. Newspapers.com : 2015. 3. "." The Cameron Sun. 29 January 1931. Newspapers.com digital image. www.newspapers.com : 2017. 4. "." The Chillicothe Constitution-Tribune. 5 July 1905. Newspapers.com digital image. www.newspapers.com : 2017. "." The Daily Standard. 7 September 1954. Newspapers.com digital image. www.newspapers.com : 2017. 5. "John Lankford, Dr. Harold Lankford's Father, Dies Today." The Mexico Ledger. 12 May 1967. Newspapers.com digital image. www.newspapers.com : 2017. 6. "Lankford." St. Louis Post-Disp atch. 13 May 1967. Online archives. Newspapers.com : 2016. "No Minors in the Train Service." Moberly Evening Democrat. 24 August 1905. Newspapers.com digital image. www.newspapers.com : 2014. 7. "U.S., World War I Draft Registration Cards, 1917-1918." Digital image. National Archives and Records Administration. Ancestry.com. www.ancestry.com : 2017. 8., Ancestry. 1900 United States Federal Census. Provo, UT, USA: Ancestry.com Operations, Inc., 2004. 9. , Ancestry. Missouri Marriage Records, 1805-2002. Provo, UT, USA: Ancestry.com Operations, Inc, 2007. 10., Ancestry. Web: St. Louis, Missouri, St. Louis Post-Disp atch Obituary Index, 1880-2009. Provo, UT, USA: Ancestry.com Operations, Inc., 2009, 2008. 11. , Ancestry.com. 1910 United States Federal Census. Provo, UT, USA: Ancestry.com Operations Inc, 2006. 12. , Ancestry.com. 1920 United States Federal Census. Provo, UT, USA: Ancestry.com Operations, Inc., 2010. 13. , Ancestry.com. 1930 United States Federal Census. Provo, UT, USA: Ancestry.com Operations Inc, 2002. 14. , Ancestry.com. 1940 United States Federal Census. Provo, UT, USA: Ancestry.com Operations, Inc., 2012. 15. , Ancestry.com. U.S. Public Records Index, 1950-1993, Volume 1. Provo, UT, USA: Ancestry.com Operations, Inc., 2010. 16. , Ancestry.com. U.S., Find A Grave Index, 1600s-Current. Provo, UT, USA: Ancestry.com Operations, Inc., 2012. 17. , Ancestry.com. U.S., School Yearbooks, 1880-2013. Provo, UT, USA: Ancestry.com Operations, Inc., 2010. 18. , Ancestry.com. U.S., Social Security Applications and Claims Index, 1936-2007. Provo, UT, USA: Ancestry.com Operations, Inc., 2015. 19. , Ancestry.com. U.S., Social Security Death Index, 1935-2014. Provo, UT, USA: Ancestry.com Operations Inc, 2011. 20. , Lankford John C. and Stella C. "." Undated clipping, circa 2000, from unidentified newspaper. Privately held 2017 by Liza Reid, [ADDRESS FOR PRIVATE USE], Labadie, Missouri, USA. 21. Ancestry.com. Birth Records, 1847-1910. Lankford birth certificate. 22. Hand-written note - Dorothy Mullen Lankford. Hand-written note. unknown. Photocopy held privately held by Liza Reid, [ADDRESS FOR PRIVATE USE], Labadie, Missouri, USA. 2017. 23. Lankford, John Clifton. . , 1939. Railroad Retirement Board Files, Mo. Div #65. National Archives at Atlanta, Atlanta, Georgia. 24. Missouri, Chillicothe. St. Columban Catholic Church, 1111 Trenton Street. Marriage Index. 25. Missouri. Death Certificates. The Department of Health & Senior Services, Jefferson City, Missouri. 26. Missouri. Jefferson. Bureau of Vital Records, Missouri Department of Health. Birth Registrations. 27. Missouri. Missouri Digital Heritage. Missouri Birth & Death Records Database. Missouri State Archives, Jefferson City, Missouri, USA. 28. Social Security Administration. Application for Account Numbers, Form SS-5. Social Security Administration, . 29. Typed notes. Typed note. unknown. Photocopy held privately held by Liza Reid, [ADDRESS FOR PRIVATE USE], Labadie, Missouri, USA. 2017.